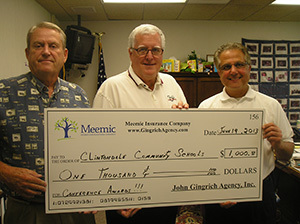 Clintondale Community School District was awarded $1,000 by John Gingrich of the John Gingrich Agency and Meemic Insurance Company. The $1,000 will be used to send four Clintondale teachers to the professional development conference of their choice. In picture, left to right: John Gingrich of John Gingrich Agency; Len Lewandowski, Director of IT at Clintondale Community Schools; and George Sassin, Superintendent of Clintondale Community Schools.